Minn Kota Riptide ST 80/i-Pilot Link No Foot Pedal - 24V-80lb-54"
We put Riptide® ST to the test, because we know you will. After thousands of hours of research and field testing, we made it quiet enough to give you the drop on fish and tough enough to withstand the most extreme conditions. We know saltwater anglers never turn down a challenge. As it turns out, neither do we. Digital Maximizer controls and optimizes power to extend battery life and reduce damaging heat. You'll stay on the water up to five times longer on a single charge. Digitally controlled AutoPilot locks onto any heading you choose and delivers you there. Infinitely variable steering adjustments provide smoother course corrections and tighter heading accuracy against wind, waves and current. Included on select models. Also available as an add-on accessory. Nothing runs cooler or more quietly than a Minn Kota®. Our extra large windings and commutators dissipate heat, resulting in cooler operation, extended battery power, and longer motor life. And our unique bearing system reduces friction to cut fish-spooking noise. So quiet, they'll never hear you coming. 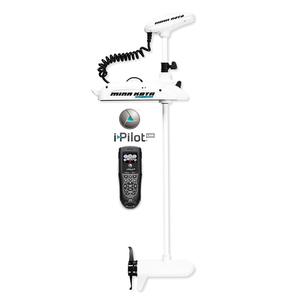 Di-Pilot® Link enables your Minn Kota® trolling motor and Humminbird® fishfinder to talk to each other. i-Pilot Link delivers automatic boat control and the power to find, store and revisit your most productive fishing spots and tracks. And you can take command of it all from either the wireless remote or the Humminbird fishfinder. It's less time positioning your boat. More time catching fish. Now you're talking. Go To Waypoint...Return to a stored waypoint with Go To Waypoint. It automatically takes you to your select waypoint at any speed you choose, and upon arrival, you can go into Spot-Lock, AutoPilot or shut off the prop. i-Pilot Link is compatible with i-Pilot Link enabled LakeMaster Digital GPS Maps, which are necessary to perform the Follow The Contour function. This product is not available at any merchants. Minn Kota Riptide ST 55/i-Pilot Link No Foot Pedal - 12V-55lb-54"
Minn Kota Riptide SP 70/i-Pilot No Foot Pedal - 24V-70lb-54"